While I try to avoid John Gruber's Daring Fireball website as much as possible since his true colors really came out before, during, and after the most recent mid-term elections, and for the simple fact he joined the ranks of Bill Palmer for not sending me my dang T-Shirt ... I have to admit that he's still a great writer - although I still despise (not in a jealous way mind you) that he's the darling of the Mac editorial/blog world right now. 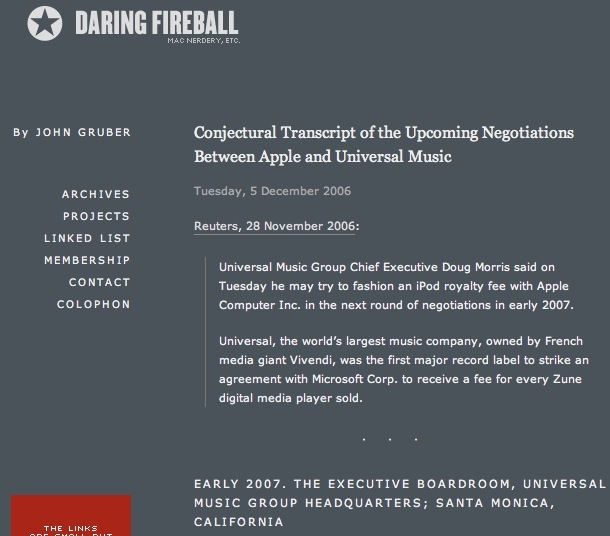 Anyway ... yesterday, Gruber published a feature titled, "A Conjectural Transcript Of The Upcoming Negotiations Between Apple and Universal Music". It was a great read, but since I have a real crystal ball and can actually see into the future ... the ACTUAL negotiations I think will be much shorter ... although I feel the conversation will start in the same way so I will just quote Gruber to start. A large table dominates the room. Seated on one side is Universal Music CEO Doug Morris and six Universal attorneys, three on each side of Morris. On the other side sits Steve Jobs and one Apple attorney. On the table in front of Morris and each of the Universal attorneys are various neatly stacked folders, contracts, and legal pads. In front of Jobs the table is completely clear; he holds nothing in his hands. Morris: Steve, it’s great to see you again. I hope your flight was good. Jobs: It was terrific, thanks. Morris: Well, let’s get right down to it. I’m sure you heard, together with our friends at Microsoft, we created a really interesting arrangement for their “Zune”. What it is, is that for each hardware unit Microsoft sells, Universal gets a small fee. A nominal fee. Morris uses his fingers to indicate the quotes. 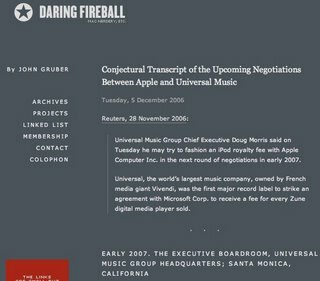 Gruber continues by saying that the conversation ends with Jobs telling Doug Morris to stick the Zune up his Wazoo (in more dramatic gross detail as Gruber tends to write). Jobs: I heard through the DIGGvine that it was "$1 per Zune sold" ... I agree ... done deal. Apple will pay Universal $1 per iPod sold ... starting in July 2007. Jobs: So that's it guys ... great meeting! Morris: So that's it ... you ... you agree? Jobs: That was great. Lets wait a week or two into August to announce new pricing at the iTunes Music Store. * Legend goes that Jobs and Wozniak first discovered the Graphical User Interface and Mouse interaction at Xerox's PARC facility and integrated it into the Mac GUI. JOBS: And since it is the computer that is the issue and not the end player, I would imagine you would want to get 1% of retail for ALL computers, not just Macs, right? Let's meet again after you've had this discussion with Dell, HP, and all the others and we can pick back up. Agreed .. and that's why I state that the article linked is a well written (if not grossly detailed) opinion.